Order in the next 3 hours, 17 minutes an 27 seconds for same day shipping. 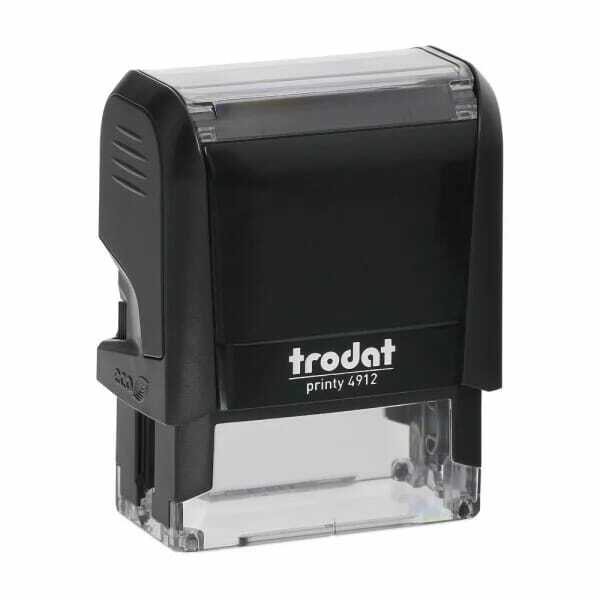 This popular self-inking stamp is ideal for short customised texts up to 4 lines, or just one or two lines in bold with your important message. Trodat Printy 4912 is produced climate-neutral with maximum possible use of recycled plastic and compensation of unavoidable CO2 footprint by investment in climate protection projects. The maximum size of the impression is 47 x 18 mm, which offers enough space for your address or contact information. This small, versatile stamp is commonly used at home or on the move, but also widely liked for office applications. Practical ideas: Simply address letters and envelopes, use when relocating to communicate your new address or sign your children's school books. A stamp with your signature (imported as a logo) and with your name - it is possible! The crystal clear viewing window ensures ultra-precise positioning of the impression. The change of the ink pad is easy and clean thanks to the special grips, which avoid contact with the pad insert. Suitable replacement pads 6/4912 are available in black, blue, red, green or violet. Dry felt pads are suitable for special inks. Replacement pads are supplied in multiple packs of two. Customer evaluation for "Trodat Printy 4912 47 x 18 mm - 4 lines"